The Western Caribbean is the most frequent destination of cruises from New Orleans. Most are 7 days long. Stops may include ports in Mexico, Honduras, Belize, Cayman Islands, and Jamaica. Cozumel is a stop on almost every cruise to the Western Caribbean. It's an island off the coast of Mexico. Popular activities include snorkeling the coral reef, swimming with dolphins, and touring ancient Mayan sites. Roatan Island (or Isla Roatan) is another stop on many itineraries, and it is the most developed of Honduras' Bay of Islands. The MesoAmerican Barrier Reef is a big attraction for divers. Other water sports include ocean kayaking and jet skis. White sand beaches are ideal for relaxing. 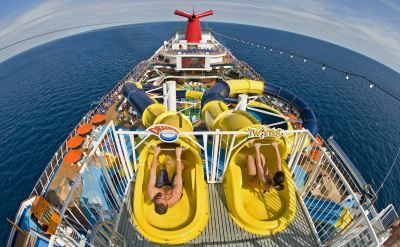 7-day Western Caribbean cruises on Carnival Cruise Line. Round-trip from New Orleans to Montego Bay (Jamaica), Grand Cayman (Cayman Islands) and Cozumel (Mexico). • 2019 departures: April 14, April 28. • 2019 departures: May 19, June 2, June 16, June 30, July 28, August 11, August 25, September 8, October 6, October 20, October 27, November 17, December 15, December 29. 7-day Western Caribbean cruises on Carnival Cruise Line. Round-trip from New Orleans to Mahogany Bay (Roatan), Belize City (Belize) and Cozumel (Mexico). • 2019 departures: April 7, May 5. • 2019 departures: May 26, June 23, July 7, July 21, August 4, September 1, September 15, September 29, October 13, November 10, December 8. 7-day Western Caribbean cruises on Carnival Cruise Line. Round-trip from New Orleans to Cozumel (Mexico), Costa Maya (Mexico) and Mahogany Bay (Roatan). • 2019 departures: November 24, December 22. 7-day Western Caribbean cruises on Norwegian Cruise Line. Round-trip from New Orleans to Cozumel (Mexico), Roatan Island (Honduras), Harvest Caye (private island in Belize) and Costa Maya (Mexico). 9-day Western Caribbean cruises on Norwegian Cruise Line. Round-trip from New Orleans to Costa Maya (Mexico), Harvest Caye (Belize), Roatan (Honduras), Grand Cayman (Cayman Islands) and Ocho Rios (Jamaica). 7-night Western Caribbean cruise on Royal Caribbean. Round-trip from New Orleans to Cozumel (Mexico), Puerto Costa Maya (Mexico) and Grand Cayman (Cayman Islands). • 2019 departure: April 6.